QKR Stampede & to "add a sun"
My card is very clean & simple. Next, I cut out the images using spellbinders circle dies. The sun is mounted on foam tape for dimension. The Hello is cut twice, once in Kraft & once in white using a Lawn Fawn Die. The Sunshine word was printed directly on to the card base. Thanks for popping by today, I do hope you like my little card! Don't forget to visit the QKR Stampede challenge blog for more inspiration & information! Love this image and beautifully coloured too! Enjoy your day and hope the sun is shining where you are! 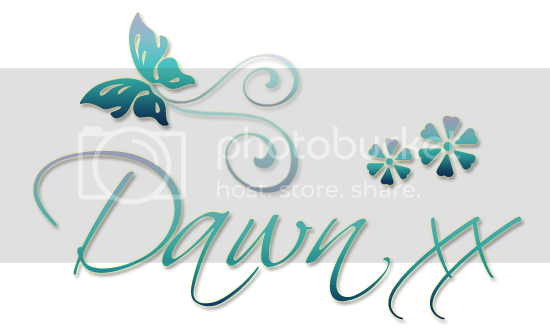 Such a lovely bright and cheerful card Dawn, such a sweet image. Great summer card,sweet image and great colour. What a great sunshine card. Love the image and that sun is so cute and sunny! This would be perfect for lots of ages and lots of occasions! Beautiful card and image, love the bright and beautiful colours. This is gorgeous, I love the cute image and beautiful sunny colours. So sweet and cheerful! Love the little lass and the sunshine! 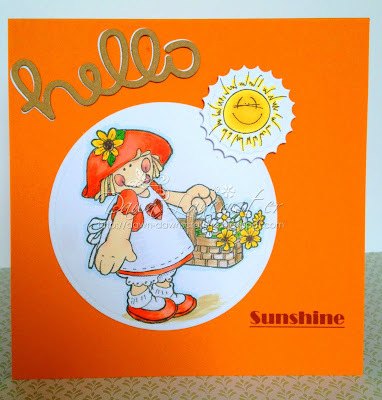 Awww such a bright ''sunshiny'' card....love the image!! Very bright and beautiful- thanks for sharing with us at Creative Knockouts. Such a pretty card! Lovely colours and a cute image. Thanks for sharing with us at The Shabby Tea room. GORgeous! Such pretty colours and design. I LOve to see how everyone makes a card using the same image. Lovely to meet you Dawn. Wasn't she wonderful to color? I loved playing with her for the QKR DT card I did. Yours is so perfectly summer! Great job, love the image color is so pretty and bright. Nice Hello as well. Well done! Thanks for playing our CAS challenge at 4 Crafty Chicks. My goodness, I need my sunglasses for this one! Love the bright colours & the wonderful sunshine! Thanks for joining us at Passion For Promarkers this week.